THE ALBUM COLLECTION Commemorates the 60th Anniversary of the Original Release of Elvis Presley, the King's First Album for RCA. FEATURES ALL of the ALBUMS Elvis recorded and RCA released in his lifetime: STUDIO, SOUNDTRACK and LIVE. It also includes compilations released that featured unreleased songs or songs new to the LP format. Elvis Presley, the singer's first album for RCA Victor, was released on March 23, 1956, with its successor, Elvis, following in October 1956. Both albums reached #1 on the US charts and achieved RIAA platinum status. ELVIS PRESLEY - THE ALBUM COLLECTION includes album titles recorded by Elvis and released by RCA during the artist’s lifelong association with the label. 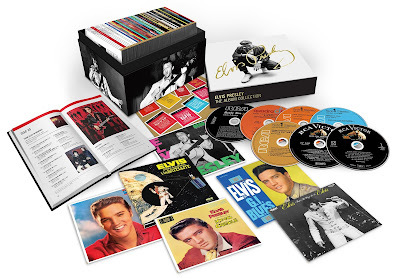 The deluxe set features Elvis's fabled Sun Sessions (recorded 1954 and 1955 at Sun Studio in Memphis, prior to Presley's signing with RCA), his first RCA sessions (January 10, 1956), and significant official Elvis album releases including studio, soundtrack and live titles in addition to compilations featuring unreleased songs or tracks new to the LP format. Highlights of ELVIS PRESLEY - THE ALBUM COLLECTION include: Elvis Presley and Elvis, the 1956 RCA studio album releases that rocketed Elvis into the pop culture stratosphere; all 17 of his film soundtrack LPs including Loving You, King Creole, G.I. Blues, Blue Hawaii, Roustabout and more; the 1969 American Sound session albums Elvis In Memphis and Back In Memphis; Elvis's stunning 1960s Nashville albums; the King's 1970s triumphant live concert recordings On Stage (1970), Elvis As Recorded Live At Madison Square Garden (1972) and Aloha From Hawaii Via Satellite (1973); compilation albums--including the Elvis' Golden Records series released between 1958 and 1968--offering many of Elvis' non-album hits; the rare RCA Camden "budget" series which feature songs recorded for Presley films but not included on the traditional soundtrack albums in addition to other hard-to-find material. Original album packaging has been meticulously restored for each of the discs included in ELVIS PRESLEY - THE ALBUM COLLECTION. Details include gatefold/die cut sleeves, original RCA Victor inserts and stickers, CD labels replicating original Side 1 labels and more. The lavish ELVIS PRESLEY - THE ALBUM COLLECTION collector's box includes a 300-page fully illustrated hard cover book featuring insightful commentary penned by Elvis Presley scholar John Jackson, discographies and recording session details (dates, locations, personnel, etc.) and more. The definitive treasure trove for seasoned fans or newcomers to these classic recordings, ELVIS PRESLEY - THE ALBUM COLLECTION presents Elvis and his music the way he was originally heard during his lifetime by contemporary audiences, through the medium of long-playing albums. This 60th anniversary anthology lovingly compiles albums and compilations of new material released by RCA during Elvis's lifetime into the definitive Elvis Presley album library. As an added bonus for Elvis fans, ELVIS PRESLEY - THE ALBUM COLLECTION includes three CDs of essential rare tracks, each volume devoted to one of the decades--the 1950s, the 1960s and the 1970s--transformed by the life and music of Elvis Presley, the King of Rock 'n' Roll. The hits of Elvis Presley--33 No. 1 singles in the U.S. alone, which help account for worldwide sales in excess of 1 billion records--have become pop standards in their own right, recognized from generation to generation. But his 57 original LPs--studio and live albums, compilations of non-album singles, film soundtracks, and even budget albums with hard-to-find material--have been reissued only sparingly during the digital era. While several of Elvis's albums have been expanded and repackaged for Legacy Editions, themed box sets and other Elvis archival projects, ELVIS PRESLEY - THE ALBUM COLLECTION presents--for the first time, in many cases--Elvis's official, original albums as they were first released and designed to be heard. has to say about Elvis HERE! new Elvis exhibit in Las Vegas HERE!